Holiday Recipes, Official Site! Holiday Recipe Ideas! World Cooking! International Recipes! Roast Prime Rib, Yorkshire Pudding ...! "A Roast Prime Rib with Red Wine Au Jus, Yorkshire Pudding and Fresh Creamed Horseradish"
First and most importantly invest in an instant read meat thermometer. They start at about $6 and are worth it. Let rib set out in the kitchen for two hours. It is best to have your rib as close to room temperature as possible before cooking, as this will ensure more even roasting. Preheat oven to 425°F. 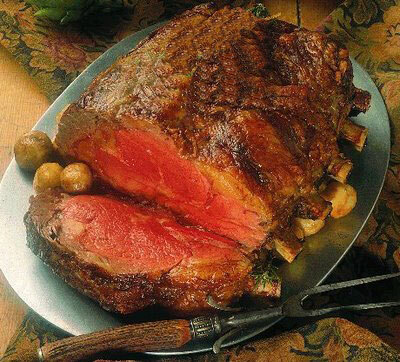 Place rib roast in a large roasting pan covered with foil (this makes for easier cleanup) on a wire rack bone side down. Rub salt and spices into the fat layer. Place roasting pan on a lower rack in the oven and cook for 20 minutes until the fat is seared and starting to brown. Turn the oven down to 350°F and roast for approximately two and one half hours more. Start testing about 2 hours into the cooking process. Test with your thermometer by placing the tip into the center of the thickest part of the meat close to the bone. 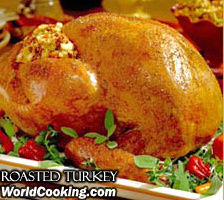 Remove the roast when the desired temperature is achieved and let the meat rest for 20 minutes before carving. This will ensure that the meat is evenly cooked and will retain its juices. Place all ingredients in a small sauce pan and simmer 15 minutes over low heat. Strain and serve warm in a sauce boat. It really helps if you have a second oven so you can make these during the last half hour of roasting the prime rib. 1/2 cup or so of the hot beef drippings from the prime rib. First of all this is almost the same as making popovers, so the same rules apply, have ingredients at room temperature and don’t let them cool too quickly when done. You will need a non-stick muffin pan for this to work perfectly. The batter sometimes sticks in a regular muffin pan. Divide the hot beef drippings between 8 muffin cups and heat the muffin pan in the oven while you are whipping the batter. You can substitute salad oil if you want. Mix flour and salt. Add milk gradually. Beat eggs well and add to batter. You could do this in a blender or food processor if you like. Remember – no lumps. Remove muffin pan from the oven. Divide batter between muffin cups and return to oven. Reduce heat to 375°F. Bake approximately 25 minutes. They should be golden brown. Turn off oven and leave the muffin pan in the oven with the door held open with a hot pad. Mix all of the ingredients together and refrigerate one hour. Serve in a large ramekin with the prime rib. 2 large onions, peeled & chopped. It has been a technique of mine for years to bake the stuffing separately from the bird. There are two basic reasons that I do this: 1) Ease of serving, especially when you cooking for a large group. 2) It is potentially hazardous to stuff a large bird and slow cook it with the body cavity filled with a mixture that contains eggs and dairy products. The rule is: keep potentially dangerous foods above 140°F or below 40°F. Four hours is the maximum time for such items to be held between the upper and lower temperatures. Blend liquid ingredients together in a separate bowl. Add the liquid ingredients to the dry blending until a smooth batter is formed. Preheat oven to 400°F. Oil and heat a 9” by 6” cake pan for 5 minutes. Add the batter to the hot pan and return to the oven. Turn oven down to 350°F. Bake until a toothpick comes out clean, approx. 45 minutes. 2 eggs, beaten with the stock. Melt butter in a large sauté pan. Sauté the onion, celery, bell pepper and garlic over low heat until tender. Cube the cornbread and place in a large mixing bowl. Add the cooked vegetables, herbs, salt* and pepper tossing without breaking the cornbread up. Blend the stock and eggs together and pour over the cornbread mix. Blend gently with a large spoon taking care not to crumble the cubes of bread. Let rest for 5 minutes. Turn gently with the spoon once again. The mixture should be fairly moist. Add more stock if too dry. Press the stuffing into a 9” by 6” cake pan that has been oiled or rubbed with cold butter. Cover with oiled or buttered wax paper and oil. Bake at 350°F for 30 minutes. Variations might include adding some dried cranberries or cooked sausage. *Chef’s tip: read the list of ingredients on the package of salt that you are going to buy. Even if it is kosher salt it may still have anti caking chemicals. Use only pure salt. Combine sugar and orange juice in a medium saucepan. Stir to dissolve sugar. Bring to a simmer. Add cranberries. Reduce heat and simmer gently until all of the cranberries pot, about 5 minutes. This recipe is the way my mom makes it. However, at my home and at restaurants I have worked in, we remove the bones from the turkeys. The breasts are then trussed and roasted separately from the legs. This gives a larger amount of bones, which makes the stock richer. It is best to start this stock a day or two before. Put bones, neck, giblets, heart, celery, carrot and onion into a large roasting pan. Roast at 375°F for about an hour, stirring occasionally, until all ingredients are evenly browned. Remove to a large stockpot. Deglaze the roasting pan with red wine. (Deglazing: Add the wine to the pan and heat over a low flame scraping the bottom of the pan gently taking care to scrape the caramelized bits of vegetables into the wine. Do not reduce too much.) Add the wine to the stockpot and just cover the bones and vegetable with water (about 8 cups). Add the peppercorns and bay leaf. Simmer the stock for 4 hours adding water if necessary. Strain the stock and refrigerate overnight. Remove the turkey fat and save. You should have about 6 to 8 cups yield. To make the gravy: heat the stock in a pot. In another pot melt the butter and 2 tablespoons of the reserved turkey fat. Add the flour and cook over medium heat, while stirring. The “roux” is finished when the flour starts to brown slightly. Add the boiling stock rapidly, a cup at a time, while whisking briskly. It should take about 4 to 5 cups. The gravy should not be too thick. Reduce over low heat if too thin. Add more stock (or water if you have no stock left) if too thick. Season with salt to taste and darken, if desired, with Kitchen Bouquet or caramel color. Any left - over stock will make a great soup base or freeze for the next time you need a quick sauce or gravy. Crush the vanilla wafers and blend with the butter. Press into the base of the spring form pan and bake 3 to 5 minutes at 350°F. Cool. Wrap pan in plastic wrap and foil. Do this in such a manner as to make the bottom and sides water tight. blending well each time. Add the yolks in the same manner add the sugar and pumpkin puree in the same fashion making sure that the mixture is homogenous. Spoon mix over the cookie crust in the prepared spring form pan, cover with foil. Bake in a water bath at 350°F for 3 hours checking with a tooth pick to see if it comes out clean. When done refrigerate overnight. Rehydrate cranberries in juice by simmering in a pan. Cool. Place a slice of the cheesecake on a plate. Spoon a few of the berries over the top of the cheesecake and garnish with a mint sprig. You can use frozen pre-made pie shell if you like or use the recipe below. Pre-bake the pie shells for about 10 minutes in a preheated oven at 350°F. Mix brown sugar, spices, eggs, yams, sweetened condensed milk and dark rum in a large bowl with a whisk until mixture is smooth. Fill the pie shells and bake for 45 minutes or until a toothpick comes out clean. Place the glazed pecans in strategic positions on the pie about ¾ of the way through the baking procedure. Moisten the pecans in a little water and toss with the sugar then bake on a sheet pan at 350°F for 3 to 4 minutes to slightly caramelize the sugar. Do not brown too much. Mix flour with salt and sugar. Dice butter into small cubes, cut into flour mixture until butter is pea – sized. Beat egg into ice water and add water – egg mixture a little at a time to flour mixture. Blend until a ball forms. Do not over mix. Divide into two balls, wrap in plastic wrap and chill for 1 hour before rolling. All Contents Copyright 2006 WorldCooking.com All Rights Reserved. Page Contents: holiday recipes, holiday recipe, holiday, recipes, recipe, international recipes, international cooking, world cooking, official site.